The Copernicus floor collections is the offer addressed to those who follow modern style and trends. Long and broad panels will enlarge the interior visually, while giving it an elegant and soft finish. The collection comprises seven colour versions, named after the Solar System planets. The brightest of all available hues, Saturn will be a beautiful match to both very bright and darker décor. Such floors reflect light, filling the room with sparkle and delicacy. Also noteworthy is the distinctly marked edges of boards and highlighted structure of oak wood. Oil finishing gives boards lightness and unique character. The Pythagoras collection will be appreciated by those who like unconventional interiors with a twist, as this parquet may be fitted in a number of ways. With this collection, each interior may be both classical and avant-garde, depending on the light rays angle. The only limitation to the combinations and patterns is your imagination! Saturn is the brightest of all hues. Soft and delicate, it reflects light splendidly, creating a vivid puzzle of elements that attract attention and ensure prominent expression of any interior. Premium Floor is the base collection offering several types of wood. The size of boards will suit all rooms – both the spacious and small ones. Each type of wood has its unique character. Choose the one which best suits your interior! Canadian Maple is the brightest type of wood available, with noticeable creamy, beige and bright yellow tones. An excellent choice for anyone appreciating simplicity and moderation in design. Premium Floor is the base collection with long, narrow panels, which enlarge interiors visually and add lightness and subtlety to it. The oak boards have been coated with the oil that imitates raw wood, making the hue similar to the natural colour of oak wood. It will be excellent for both spacious and smaller interiors, giving them a warm feeling and forming a superb basis for various concepts of interior décor. The Copernicus collection is a contemporary design above all else. Large size of boards is perfectly in line with all seven colours, named after the Solar System planets. Jupiter is a bright and warm tone. It will be suitable in classically decorated interiors, but also in more daring ones – it will give them shine, warmth and glow. The boards have distinctly marked edges and accented natural wood structure. Surface covered with oil make the floor look crisp and elegant. The Copernicus collection was created for those who love modern-shaped floor boards. Broad, long and parallel elements enlarge the interior visually and serve as an excellent basis for a variety of arrangements. A distinct wood structure will highlight the original design of floors. Neptune is one of seven colour versions available in this collection. A delicate melange of beige and grey is an excellent match for both bright and darker decors. The bottom layer of a board has been reinforced with hard wood at its fronts, and with oil finishing of a surface as an embellishing touch. The edges of boards are distinctly outlined, and natural wood structure clearly accentuated. With its thickness and two-layered structure, the Copernicus collection will be excellent for floor heating installations. A classics of wooden floors – the herring bone pattern regains its glory. The Chopin collection reflects the once fashionable floor pattern. Today, its association with retro style also finds its way in more fancy, moderns designs. The white oil finish with structure and phase create a gentle and bright beige floor with a slight ashen touch. This is an excellent choice for the interiors that need to be lit and enlivened. It is also a perfect basis for daring, multi-colour interior arrangements. The Copernicus range includes modern-design broad floor panels, thus becoming a simple yet neat basis for any interior décor. The Copernicus floor will be an excellent match for a variety of designs and interiors – an ideal feature to all those with a designer’s inclination who are fond of rearranging their homes often. The Copernicus Erde hue is one of the closest to natural wood. The highlighted structure of wood rings and edges ensure its character and elegance. The finishing touch of oil will retain the floor’s natural beauty for many years to come. Ponadczasowy parkiet w kolorze drewna dębowego. To absolutna klasyka wśród podłóg! Niezapomniana jodełka francuska, która na nowo króluje wśród wnętrzarskich trendów. Jodełka w nowoczesnym wydaniu jest stonowana, ale z charakterem. Wypełnia wnętrze wyjątkowym blaskiem i świetnie się komponuje z różnymi pomysłami na jego wystrój. Dąb to jeden z cieplejszych odcieni desek, umiarkowanie jasny. Deska ma naturalną barwę, podkreśloną strukturę drewna i krawędzie. Elegancja sama w sobie! The Premium Floor line comprises floors that demonstrate an intriguing form and broad colour palette. Long boards enlarge floor optically, whereas narrow elements add subtlety and lightness to it. Oak will embellish any style of interior and fill it with warmth. 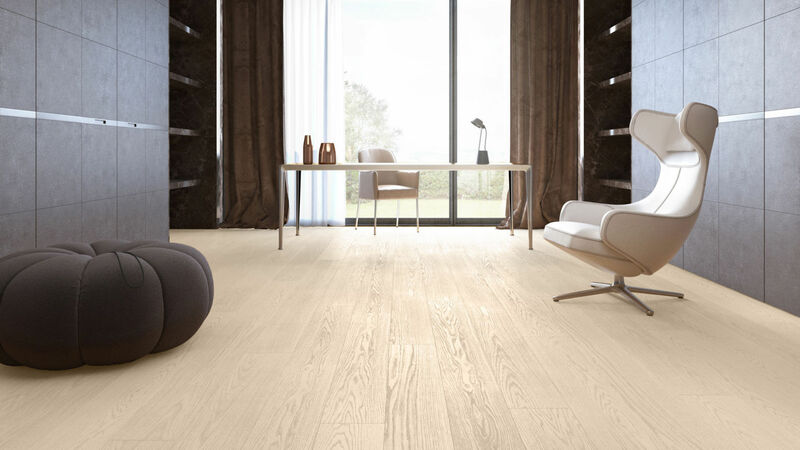 Its wood structure, visible knags and a delicate, natural hue will make the floor unique and timelessly elegant. The Pythagoras collection includes short, broad panels that may be fitted in a variety of ways, just as you like it. Depending on the light rays angle, the floor may look either classical or avant-garde, giving the interior a unique and surprising character and energy. Mars is a warm hue with dominating beige, slight ginger note and clearly visible wood structure. This floor is one of the kind! If you want to decorate the interior with floor boards that combine a classical form and modern design – look no further – the Mars Copernicus Oak will be the best choice. This line comprises long and broad panels and intriguing colours. Mars is one of seven colour versions in the Copernicus collection, with moderate hue intensity. With its expressive structure, this genuine wooden floor will embellish any interior, regardless of its décor. The board fronts are reinforced, brushed and oil-rubbed, whereas two-layered structure makes it an excellent choice for floor heating installations. Copernicus is a range of long and wide boards. It manifests classical elegance as well as serene, calm colours, named after the seven planets of the Solar System. Thick boards and their two-layered structure make this collection an excellent choice for floor heating systems. In addition, the reinforced face and oiled surface will ensure its durability for long years to come. Venus is one of the darkest hues, which will be perfectly suitable for larger and strongly lit interiors. A deep and tasteful colour is an excellent basis for furniture coming in a variety of styles and colours. Durability, elegance and contemporary design – these are the terms that best describe the Copernicus collection. Long, massive panels will visually enlarge the interiors, whereas its reinforced structure will ensure its durability for many years, while retaining a crisp and fresh appearance. Mercury is the darkest hue available in this range. It will fill the interior with spatial depth and home-like warmth and it will be excellent with various décor concepts. With clearly highlighted board edges and wood structure with visible snags, the Mercury floor is bound to add character and unique atmosphere to any room or interior. Discover our collection of long boards. It is where you will find a variety of wood types, broad palette of colours as well as numerous finishing methods. Create a suitable atmosphere and appreciate the classical beauty of wooden floors. American nut is a dark, intensely brown colour that will be a perfect choice for large and well-lit spaces – it will ensure more vividness and crisp, and the floor will never go unnoticed. This product will be a perfect match with either bright or dark furniture. Premium Floor is the base collection comprising classical, long boards and numerous wood types. It is this classics where the powerful character of this collection rests – elegance, good taste and endless options of interior arrangement. The Castano oak is a dark and warm material that is bound to be appreciated by those fond of vivid and expressive floors. The hues of boards differ slightly, making the entire floor a unique puzzle of patterns and light. This floor is the tradition and modernity combined. Depending on the fitting, long and narrow boards in the Premium Floor collection will visually broaden or lengthen the interior. This is our base line of floors – modern, serene and elegant. Smoked Oak is the darkest hue in this collection – it is intensely brown, approaching black at places. Depending on the class of wood, the hue of boards may differ slightly, thus ensuring an intriguing and unique effect. Classics and character at its best. The Chopin collection is the absolute classics of floors. A timeless herring bone pattern, returning to its glory after many years. A lavish arrangement of woodblocks will enliven and light up any room. Despite being associated with a retro style, the Chopin collection will be perfectly suitable even for very modern interiors. Smoked Oak is the darkest available hue. A dark-brown, nearly black at places, it will be suitable for large and well-lit floors. This colour is a designer’s challenge and an invitation to experiment with contrasting colour setups. Classics and modernity combined.